The original Borderlands ended on a low note: players finally reached the fabled Vault only to find an abrupt and repetitive boss fight with a big-ol' tentacle monster called the Destroyer. As a result, the Destroyer has become a bit of a running gag in the series. According to a newly discovered teaser, Borderlands 3 will keep that gag going - and potentially answer some big questions about the Borderlands universe in the process. As YouTuber Joltzdude139 discovered, the version of the Borderlands 3 box art which Gearbox has been using as the background of its Twitch channel contains a hidden message not seen in the original version. Two lines of morse code - and yes, Gearbox does seem to have a thing for morse code secrets - are printed on either side of the art's central Psycho. Joltzdude139 (and other Borderlands sleuths) decoded these messages and found that they ask two questions: "Where is the first vault hunter?" and "Who is the Destroyer?" 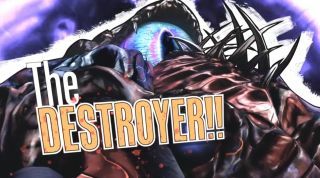 The Destroyer has appeared (or at least been mentioned) in every mainline Borderlands game so far, so another appearance in Borderlands 3 isn't actually that far-fetched, even if it is supposed to be dead. It's practically tradition at this point. That said, I've always remembered it as a harbinger of, well, tentacles and disappointment, so I never thought to ask who it is. But if it is a who as this question suggests, it is rather suspect that the other hidden message mentions "the first vault hunter." Vault hunting is already an established profession at the start of the original Borderlands, so obviously somebody came before Lilith and the gang. Will Borderlands 3 tell us who that was? Will it tell us that the first vault hunter somehow became the Destroyer? Because that's all I can think of, and that would be a very Borderlands-brand twist. No tentacles, sorry, but our Borderlands 3 trailer breakdown is filled with other secrets and clues.